The Yorkshire Terrier is a small dog breed of terrier type, developed in the 19th century in the county of Yorkshire, England to catch rats in clothing mills. The defining features of the breed are its size, 3 pounds (1.4 kg) to 7 pounds (3.2 kg), and its silky blue and tan coat. The breed is nicknamed Yorkie and is placed in the Toy Terrier section of the Terrier Group by the Fédération Cynologique Internationale and in the Toy Group or Companion Group by other kennel clubs, although all agree that the breed is a terrier. A popular companion dog, the Yorkshire Terrier has also been part of the development of other breeds, such as the Australian Silky Terrier. For adult Yorkshire Terriers, importance is placed on coat colour, quality, and texture.The hair must be glossy, fine, straight, and silky. Traditionally the coat is grown-out long and is parted down the middle of the back, but "must never impede movement. From the back of the neck to the base of the tail, the coat should be a dark gray to a steel-blue, and the hair on the tail should be a darker blue. On the head, high chest, and legs, the hair should be a bright, rich tan, darker at the roots than in the middle, that shades into a lighter tan at the tips. Also, in adult dogs, there should be no dark hairs intermingled with any of the tan coloured fur. A Yorkshire Terrier puppy, 4 weeks old, displaying the characteristic black/steel black and tan coat. Adult Yorkshire Terriers that have other coat colours than the above, or that have woolly or extra fine coats, are still considered to be Yorkshire Terriers, and will be just as good of a companion as a dog with the correct coat. The only difference is that atypical Yorkshire Terriers should not be bred. In addition, care may be more difficult for "woolly" or "cottony" textured coats, or coats that are overly fine. One of the reasons given for not breeding "off-coloured" Yorkies is that the colour could be a potential indicator of a genetic defect that may affect the dog's health, a careful health screening can clarify if any health risks exist or not. 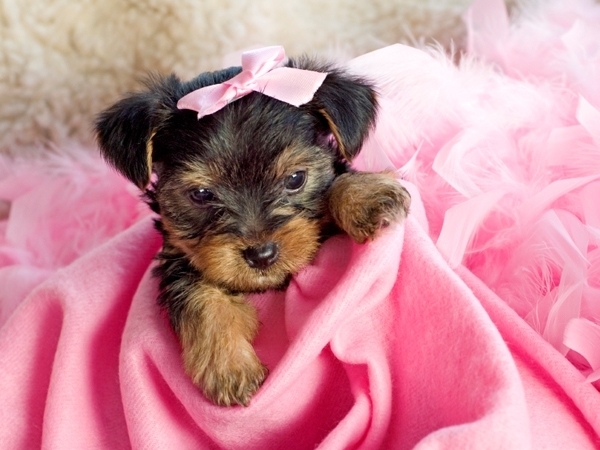 A newborn Yorkie puppy is born black with tan points on the muzzle, above the eyes, around the legs and feet and toes, the inside of the ears, and the underside of the tail. Occasionally Yorkies are born with a white "star" on the chest or on one or more toes. These markings fade with age, and are usually gone within a few months. It may take up to three years or more for the coat to reach its final color.P. H. Combs, writing in 1891, complained about show wins awarded to puppies, when the dog's coat does not fully come in until three or four years old, "and the honor of winning such a prize (for a puppy) can therefore be of but little practical benefit to the owner" since the adult dog's color cannot be exactly predicted. The typical fine, straight, and silky Yorkshire Terrier coat has also been listed by many popular dog information websites as being hypoallergenic. In comparison with many other breeds, Yorkies do not shed to the same degree, only losing small amounts when bathed or brushed. All dogs shed,and it is the dog's dander and saliva that trigger most allergic reactions. Allergists do recognize that at times a particular allergy patient will be able to tolerate a particular dog, but they agree that "the luck of the few with their pets cannot be stretched to fit all allergic people and entire breeds of dogs." The Yorkshire Terrier coat is said to fall out only when brushed or broken, or just said to not shed Although neither of those statements agree with what biologists, veterinarians, and allergists know about dog fur, allergists "think there really are differences in protein production between dogs that may help one patient and not another", meaning that some allergic people may not have allergic reactions to a specific dog, like the Yorkie. Owners may trim the fur short for easier care. For shows, the coat is left long, and may be trimmed to floor length to give ease of movement and a neater appearance. Hair on the feet and the tips of ears can also be trimmed. [The traditional long coat is extremely high maintenance. To prevent breakage, the coat may be wrapped in rice paper, tissue paper, or plastic, after a light oiling with a coat oil. The oil has to be washed out once a month and the wraps must be fixed periodically during the week to prevent them from sliding down and breaking the hair. Elaborate coat care dates from the earliest days of the breed. In 1878, John Walsh described similar preparations: the coat is "well greased" with coconut oil, the dog is bathed weekly, and the dog's feet are "carefully kept in stockings. The Yorkshire Terrier is a tan dog with a blue saddle. Particolors exist, although they are not correct for the breed standard. The particolor coat is white with black/blue and tan. It is very rare to get a particolor, and if one is found, it tends to be very expensive.Some Yorkshire Terriers are liver or chocolate, a brown color; they are unable to produce black pigment.The breed is defined by its color, and such non-standard colors may indicate health problems or cross-breeding with other breeds of other colors.The AKC registration form for Yorkshire Terriers allows for four choices: blue and tan, blue and gold, black and tan, black and gold. Color alone will not affect whether or not a dog is a good companion and pet. Even though off-colored Yorkshire Terriers are advertised at premium prices, being of an unusual or untypical color is neither new, desirable, nor exotic. A three year old Yorkshire Terrier, displaying a black and tan coat. Until recently, mismatched Yorkshire Terriers could be crossed with Biewer terriers, a new breed originated in Germany from party colored Yorkshire Terriers.Although the American Kennel Club will not deny registration of a Yorkshire Terrier on color alone, the Yorkshire Terrier Club of America has a directive that "any solid color or combination of colors other than blue and tan" for adult dogs is a disqualification, and "dogs of solid color, unusual combination of colors, and party-colors should be disqualified. The ideal Yorkshire Terrier character or "personality" is described with a "carriage very upright" and "conveying an important air. "Though small, the Yorkshire Terrier is active, loves attention, very overprotective and should not show the soft temperament seen in lap dogs.